Would you like cream with that? After a very snowy week when the rest of the world seems to think spring had sprung, we were watching the forecast for signs of hope. Friday night we were picking directions for a drive on Saturday. 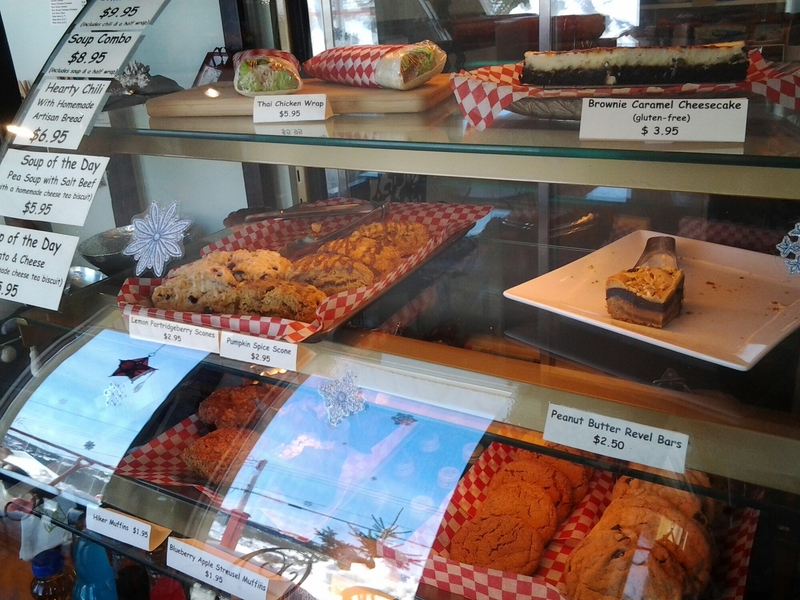 Steve told us our order was already put in when we walked into The Gander Bread Box around 9:30 Saturday . Creatures of habit when it comes to breakfast he put our order in when he saw our car pull in. Even though we’ve tried it without the bacon recently, the bagel sandwiches here are what we look forward to after the first coffee at home. 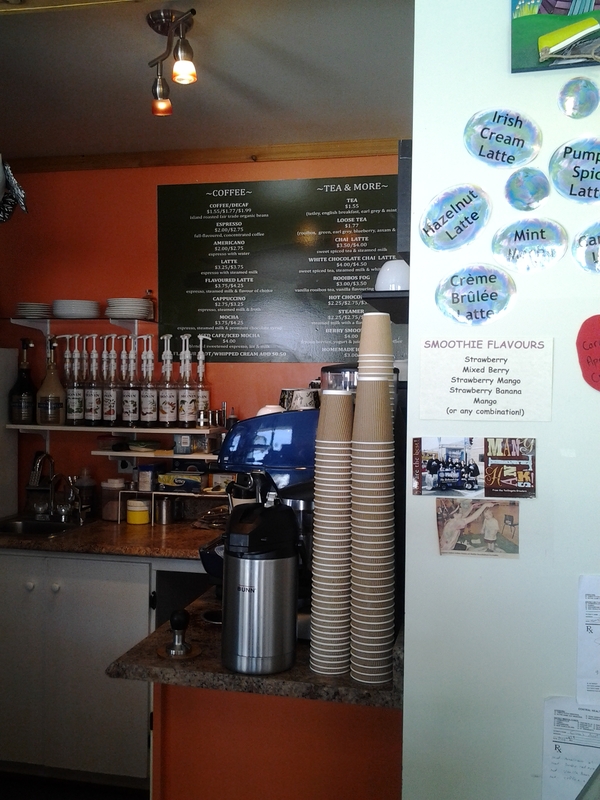 I even multitasked and took the flyers to do a grocery list at the BB while we had coffees. A result of a great visit with Steve and Marlene about local business and great (and not so great) customer service experiences we’ve all had over the years, we took a considerable amount of time before we were back in the car with only bread and bagels purchased by 11:10. By mutual decision, grocery shopping was postponed for the day and we hit the road. Our Samsung Galaxy tablets are our technology of choice when we travel. We forgot one of our chargers in Lewisporte a couple of weeks ago when gallivanting and sharing the remaining charge was only working to a point. We need one each. All of my pictures and video and much of my blogging, including ‘bediting’ are done on my tablet. Bediting is a term swiped from Newfoundland comedian Matthew Wright and refers to writing in bed or reworking past posts, jokes or resumés, I think. 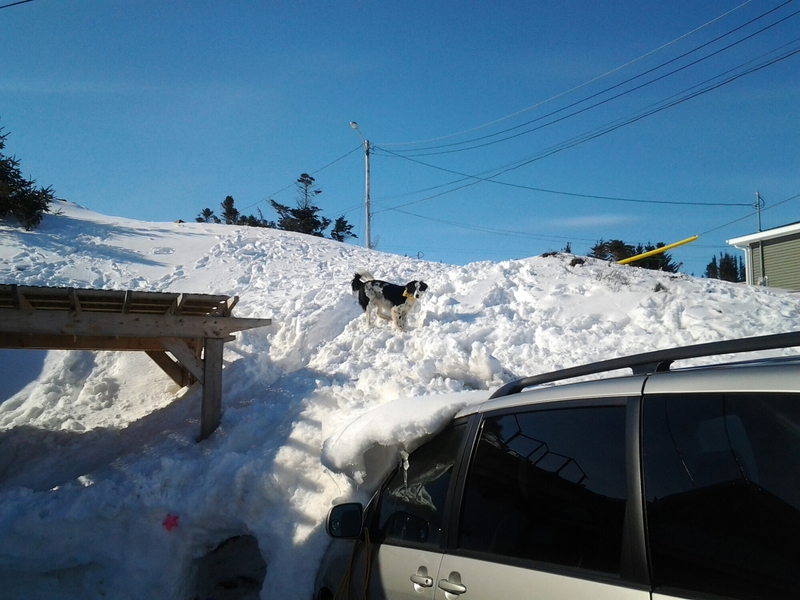 Crazy snowfall amounts in the Atlantic provinces have made news worldwide. 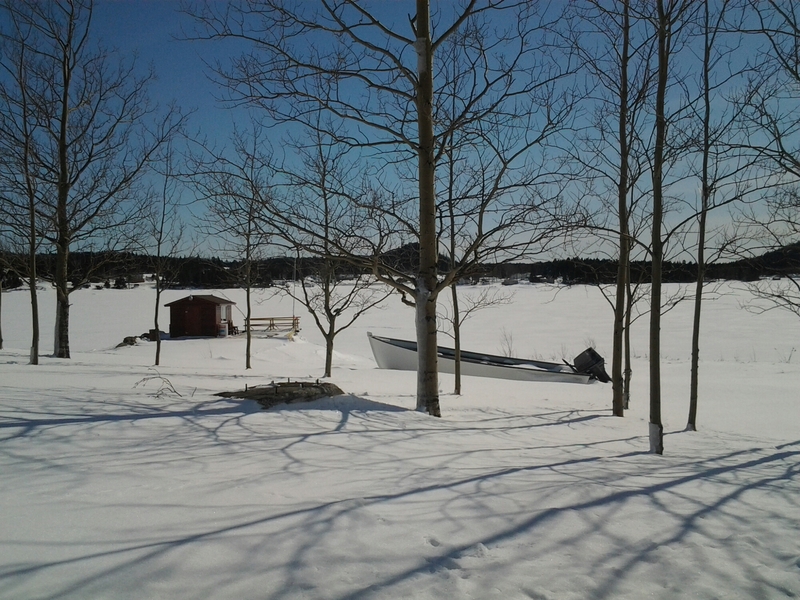 We’ve had a civil winter, as some say around here but the past week did thicken and whiten the snow pack. There were trucks and trailors scattered on the shoulders of the roads as snow machines were let out for a run. 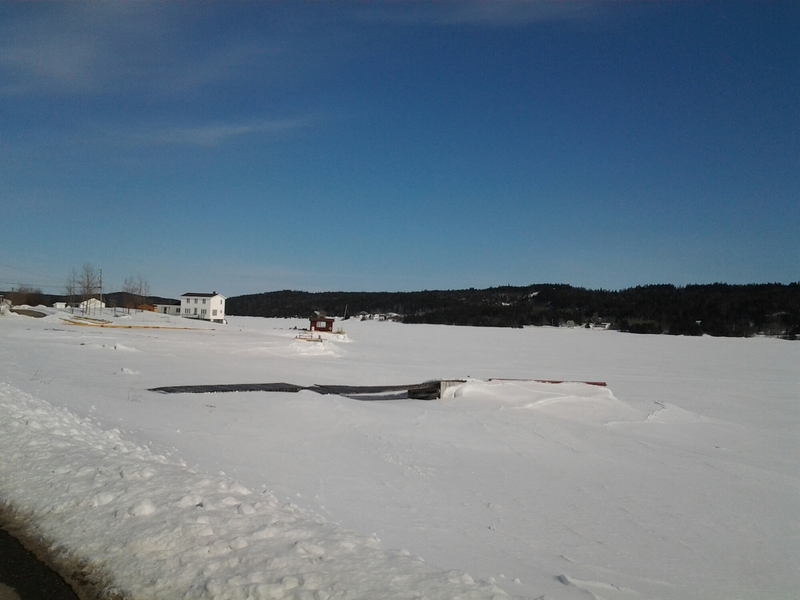 Large ponds and harbours were patterned with snowmobile tracks and the occasional ice fishers, men and women and children. 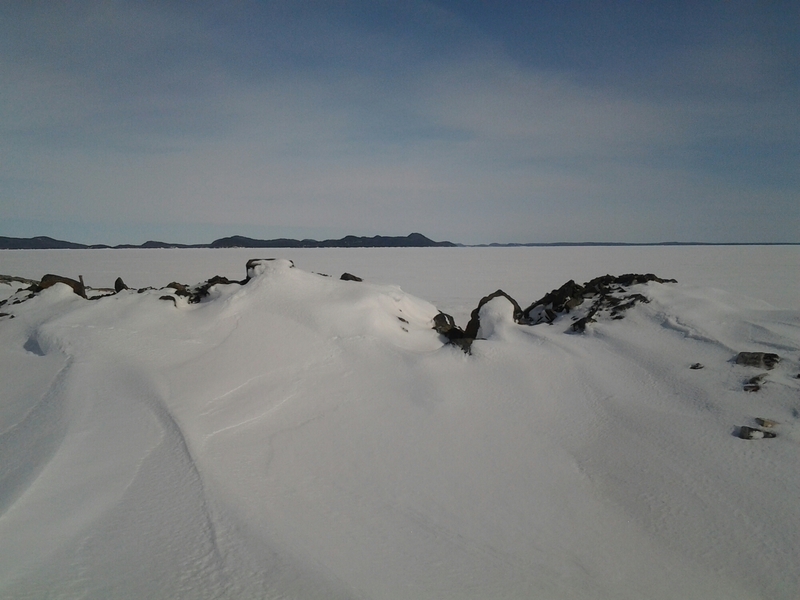 Snow mobiles passed meters away from large longliners locked in the Twillingate ice or past wharf heads in Embree and Boyd’s Cove. I’m not sure if it was warm or just the relativity to the cold temperatures we’ve had but when Leo stopped a number of times to let me get out without my coat to take some pictures of this beautiful day it did seem spring-ish. I saw several nice lines of clothes getting dried and stiffened in the winter air. 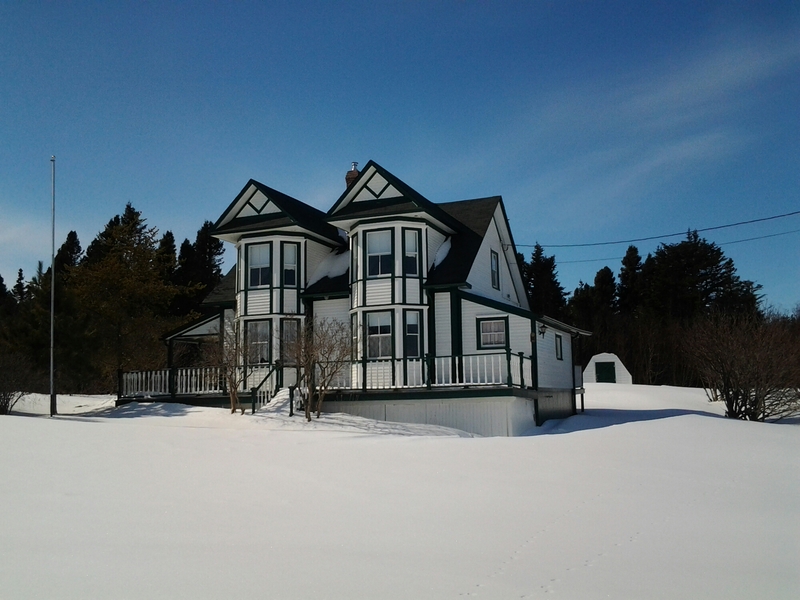 With an idea of the house in question, we thought we’d spotted it from the main road leading to a couple of dead ends on lovely roads leading to the shore around Embree. When I thought I saw it and we turned on Water Street, Leo assured me we were on the right road and we continued our surveillance weekend drive. While not at all disappointed in our finding these beautiful views we couldn’t locate our target. It was almost like they are hiding from us. We returned to the main road without locating the cabin in question but having found a museum to add to the summer Embree tour. Back on the main road, we could again see the house we really want to get invited to for a weekend or a month sometime and we turned around to investigate further take full benefit of the beautiful day for taking pictures by studying the surrounding wharves and stages to pin-point a nice location…. 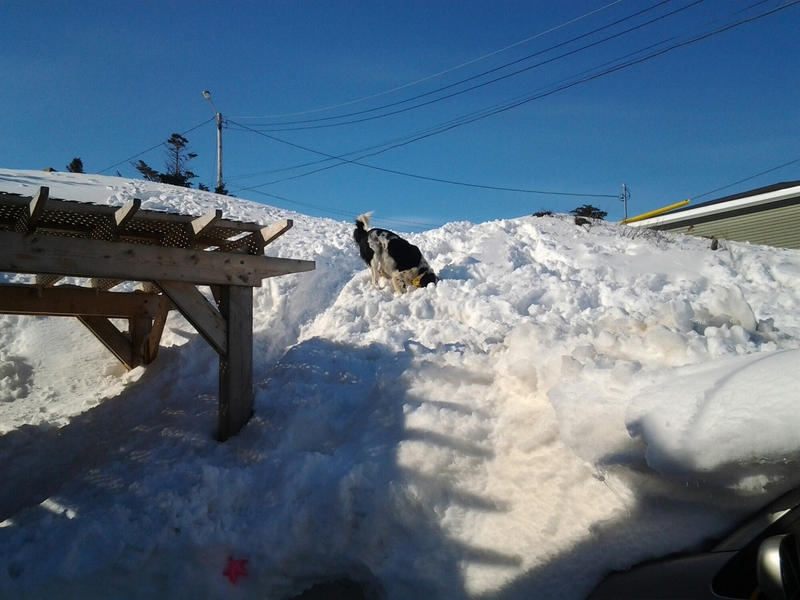 Back in Lewisporte we stopped at the Mall for a quick bathroom break and ran into a friend from Fogo who reminded us we’d spent this weekend last year with her at the Fogo Island Inn. There wasn’t this much ice last year at this time. 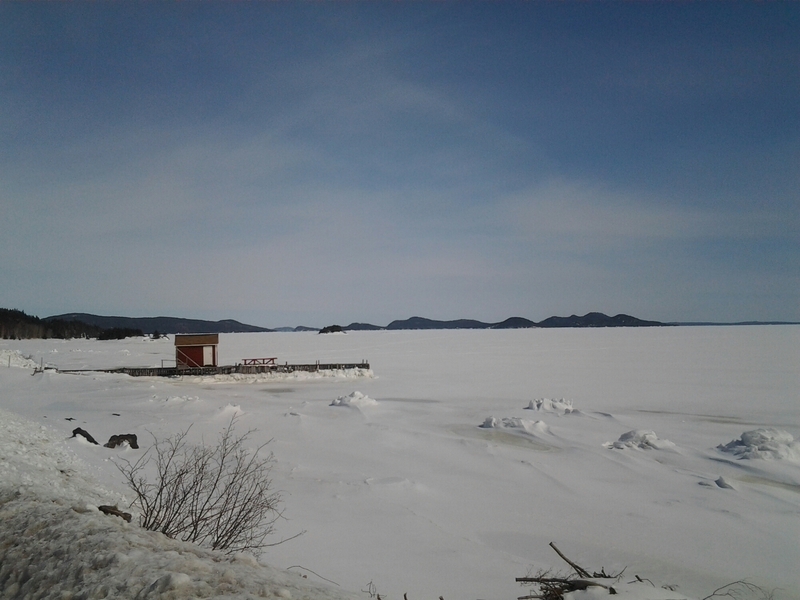 We wished her a Happy Birthday based on that tidbit of a year ago and were off again, heading around the Loop towards Campbellton and Loon Bay. It was a great day with lots to look at including moose tracks, new home construction and ice as far as the eye could see in most places. We did see a few open areas where currents were strong enough to remind us it’s the Atlantic Ocean and shouldn’t be trusted. We drove through the community of Birchy Bay and saw lots of new home builds which was encouraging to see. I’m guessing some benefiting from the ‘turn around’ life style of working out West or up North (or even in exotic areas like South America) but I hope too there are people benefitting from local economy and able to afford to work home and have a comfortable new home. There were some big houses but also some ‘family houses’ of a reasonable and affordable size. 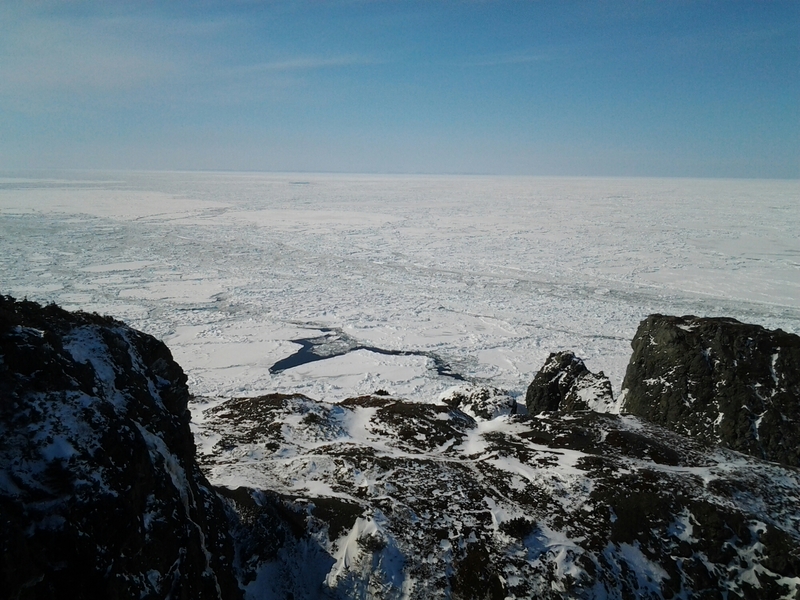 We eventually reached the junction where 340 continued to Twillingate or we could loop back towards home. On a roll, we continued on towards Iceberg Alley to check out the sights. 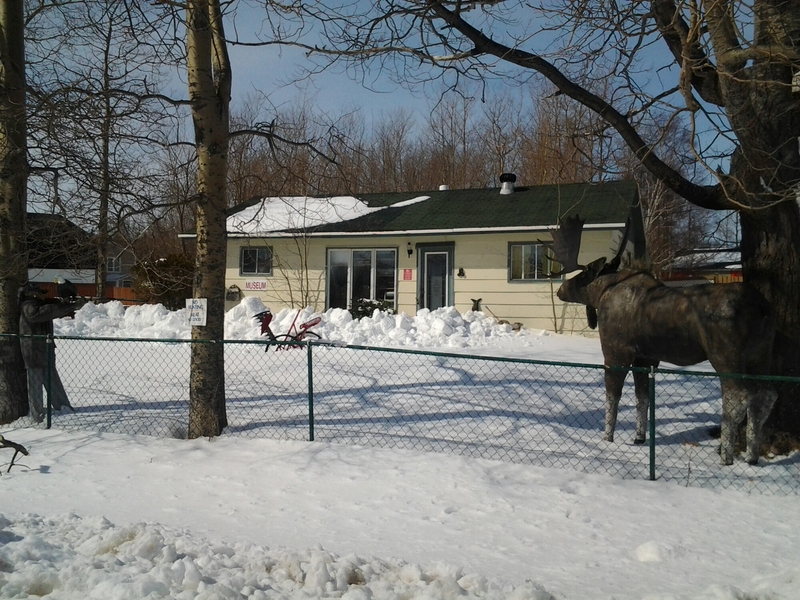 Leo’s mom lived in Boyd’s Cove as a child after her own mother had passed away. 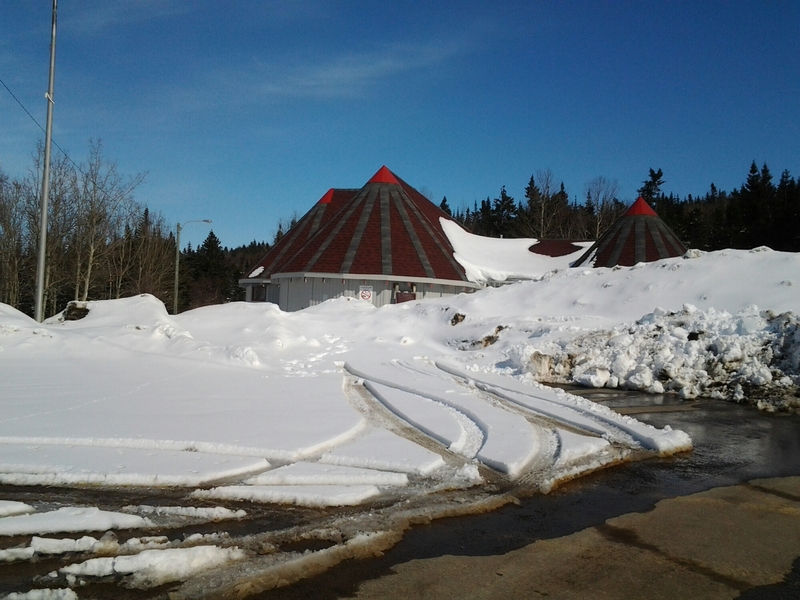 We drove around a bit and as far as the Beothuk Interpretation Centre which is definitely a seasonal operation. There were so many places to stop and look and marvel on a bright sunny day. Heading over the causeways that join the islands we looked for ducks and open water. There wasn’t much of either. 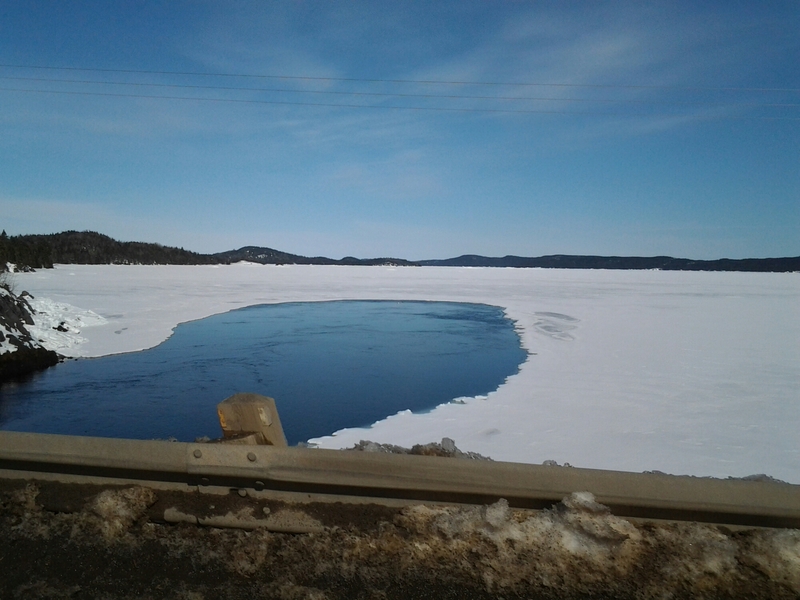 Open water around the causeway. Currently there is a Live Auction going in about the Manolis L Oil Clean up Effort on Facebook. We had a look at the location of a number of the businesses who made donations. If you are reading this before April 12, 2015 click on the link at the beginning of this paragraph to see the great lots up for auction. 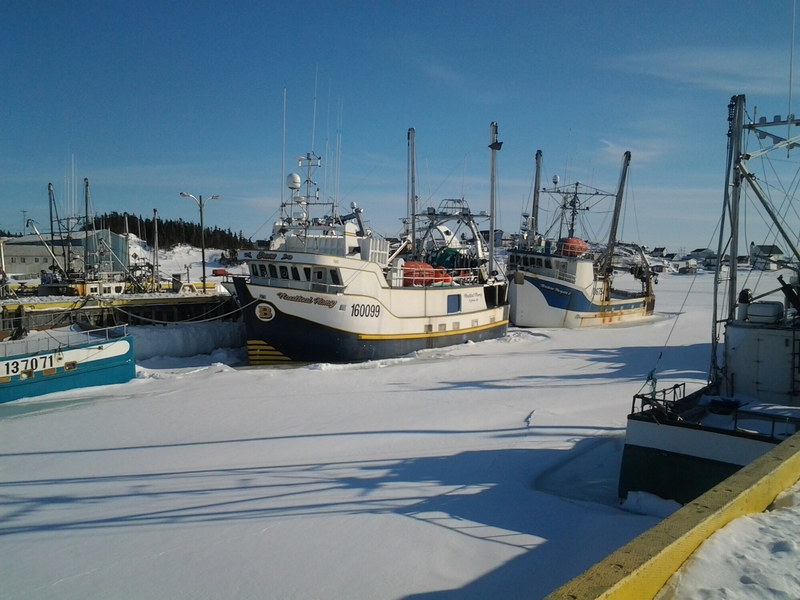 After that date, click here to learn about the Manolis L which is full of oil and deteriorating on the ocean floor near Twillingate thirty years after sinking. Everything you see in this post and my blog will be jeopardized if this vessel continues to leak. Destroyed might be a more appropriate term. There are donations of art, crafts, accommodations and books. Boat tours and restaurant meals are offered but the real prize in my eyes is a quilt made by four women from the Winds and Waves Artisan Guild located in Joe Batts Arm, Fogo Island. Lillian Dwyer, Millicent Dwyer, Violet Combden and Donna Rowe created a queen sized panorama from sea to sky. This is everything we risk losing if the oil is not safely removed. The picture only shows the bottom third of the master piece. A volunteer committee has been trying to bring attention to this issue for two years with only lip service coming from the Federal politicians. Coast Guard is using a cofferdam to collect leaking oil but an oil leak is never detected until it hits the surface. 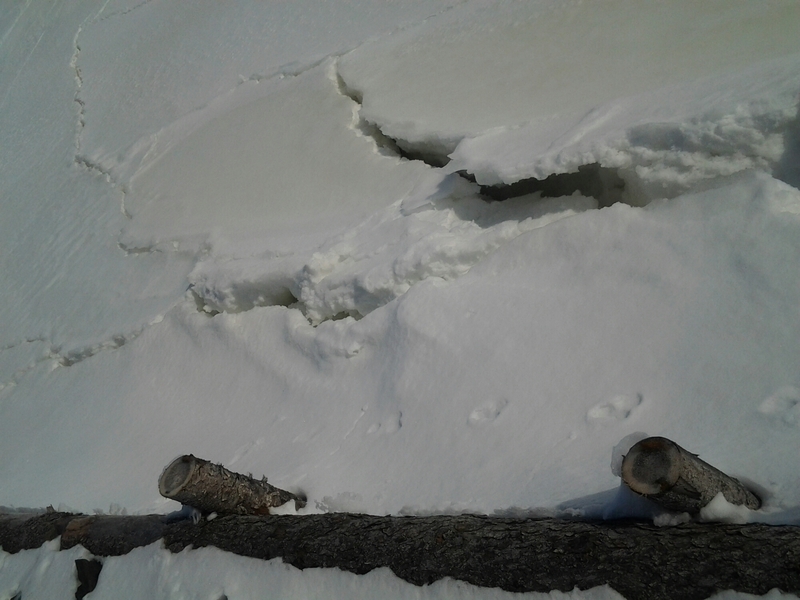 With heavy ice conditions now, it could be a very large and wide spread disaster before being seen on shore. 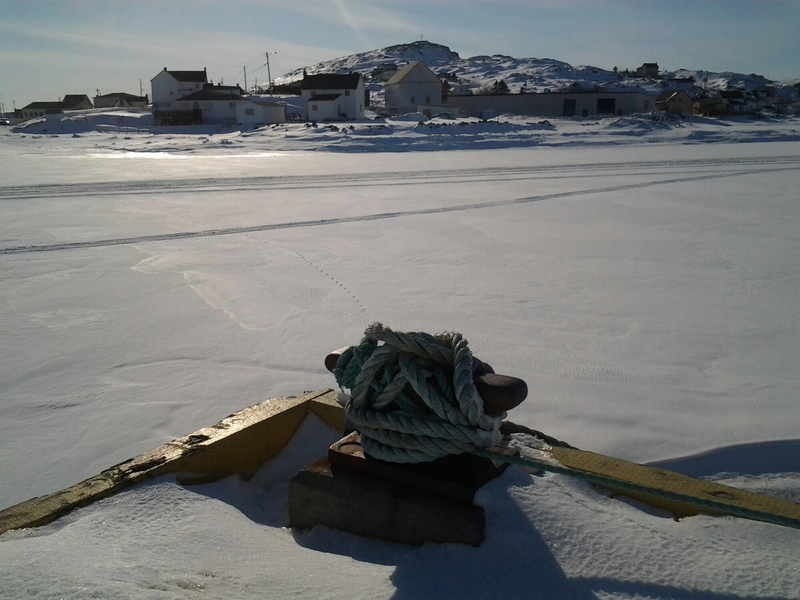 Feel encouraged to check the links and do your own search about the Manolis L. Please. We headed first to the Long Point Lighthouse and as we approached the parking lot we could see men on the viewing platform with binoculars. In the summer, it would be full of tourists. 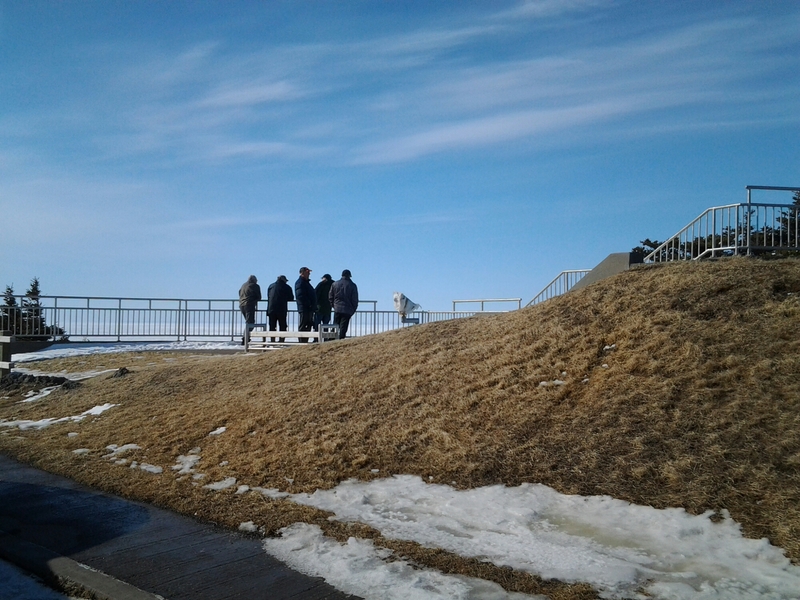 Tourist flock here to see icebergs, whales and sea birds as they travel through Iceberg Alley. 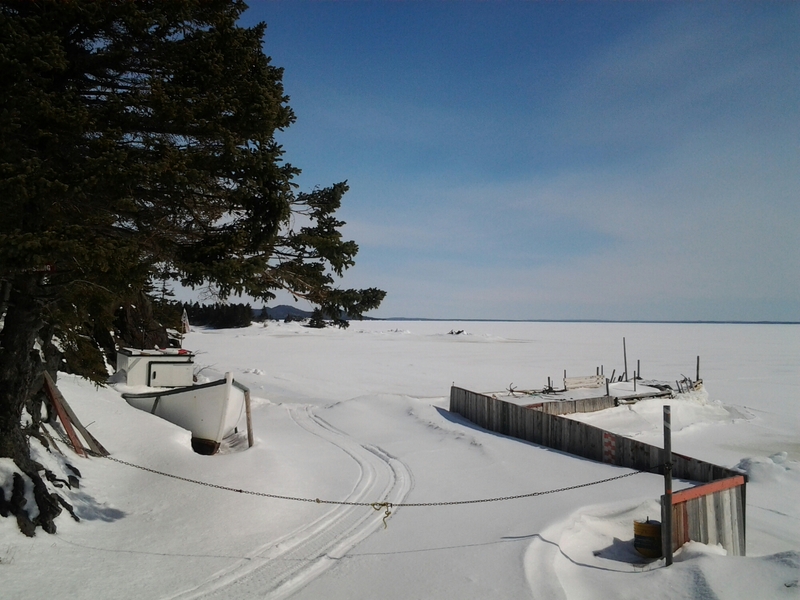 This time of year, local men are checking the status of ice and whether or not there are birds or seals to hunt. 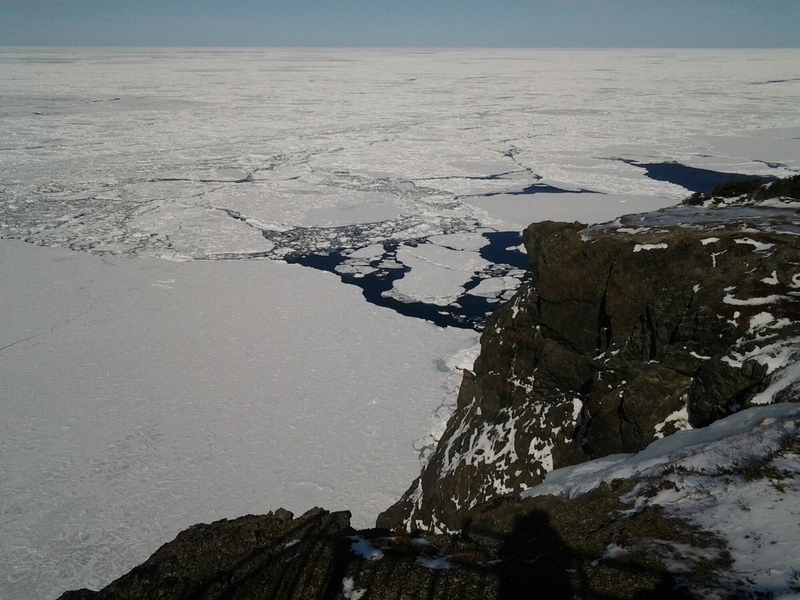 We could see a few seals very far off but the tight ice left little room for anything that spends time above the water. 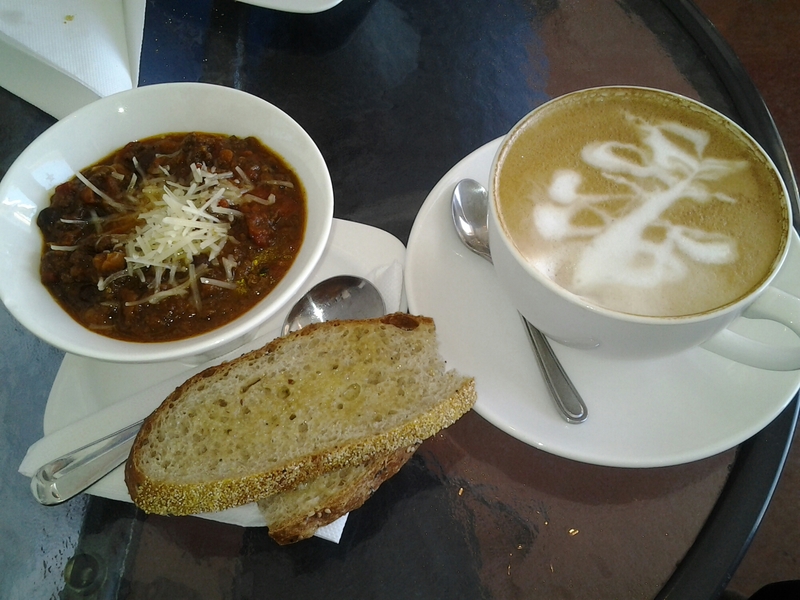 Crow’s Nest Café is a usual spot so we were decided on a bowl of chili each before we were even parked. This is a happening spot, summer and winter. We were lucky enough to get one of the tables and all seats were filled moments after we ordered. 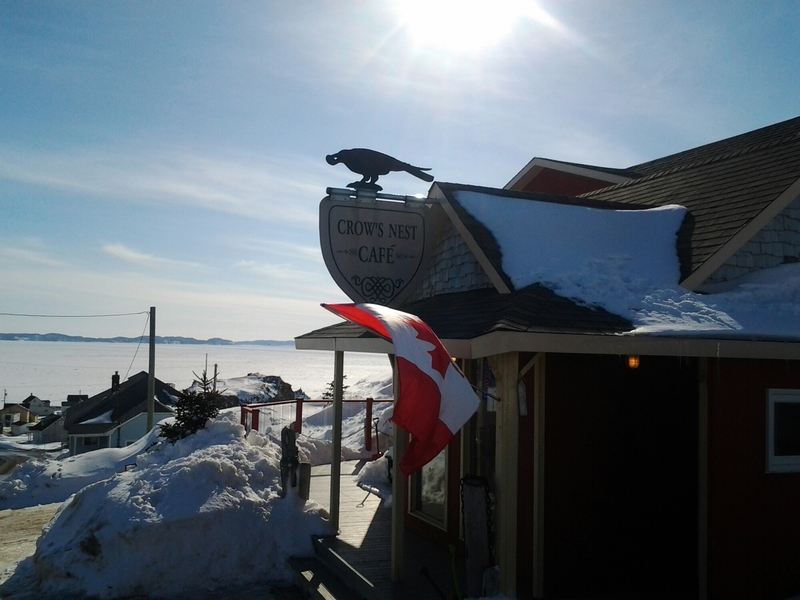 With a variety of homemade soups, cakes and sandwiches and excellent coffee, the local residents keep the winter hours of Wednesday night through Sunday very busy. A couple of tables of women were chatting and avoiding the snow and housework according to their laughter and conversation. Another couple came in for a quick coffee as they were out shopping and I noticed them later going into their own Bed and Breakfast property later in our day. Two young teenage boys (maybe preteen) came in for hot chocolates and a treat. One counted out his cash from a roll of quarters and the other ordered his cookies and enquired on the price of hot chocolate. Kate asked if he wanted whipped cream and did the calculations. He could get a medium with the money he had, but no whipped cream or a small with cream. He opted for the small with cream. Smart boy! We lingered long enough that I could shop for some art cards and take some pictures without bothering other clients. 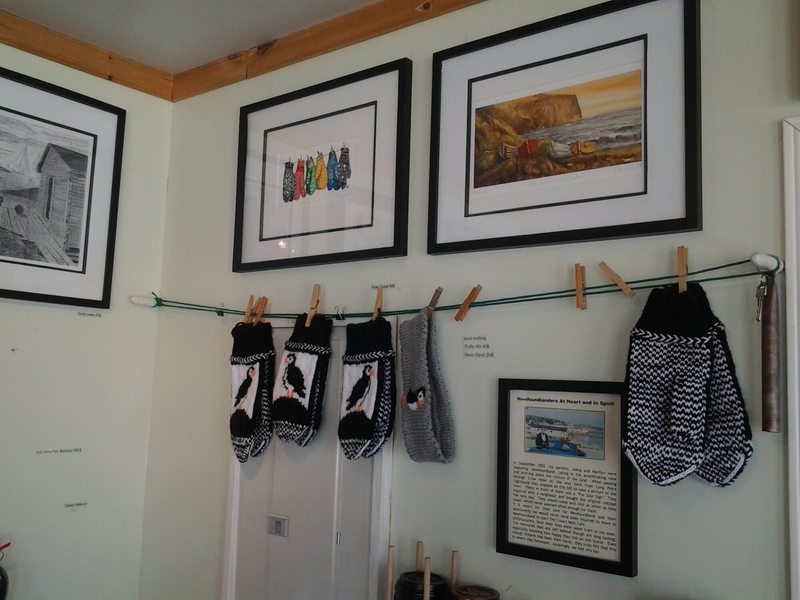 Original and reproductions by Newfoundland artists from the Grumpy Goat Gallery and Keli-Ann Pye-Beshara. 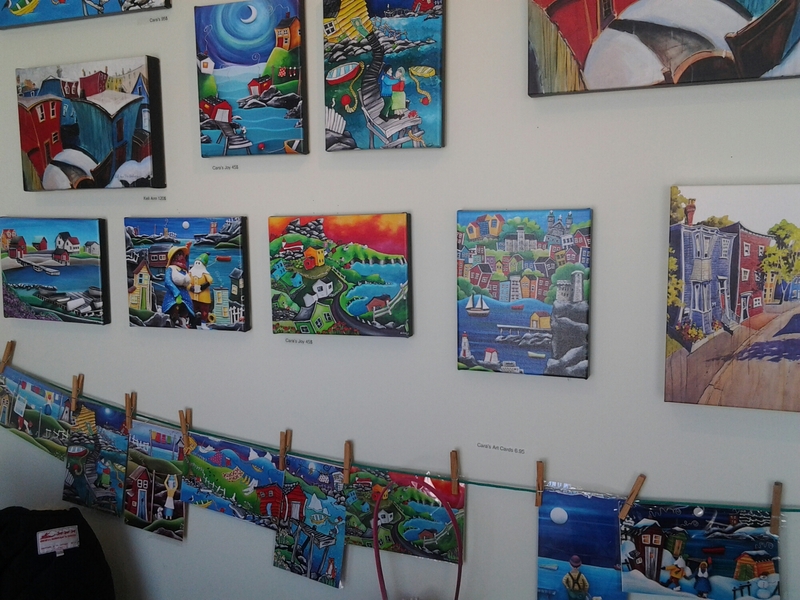 Local artists Ted Stuckless and Daniel Anstey are also featured. 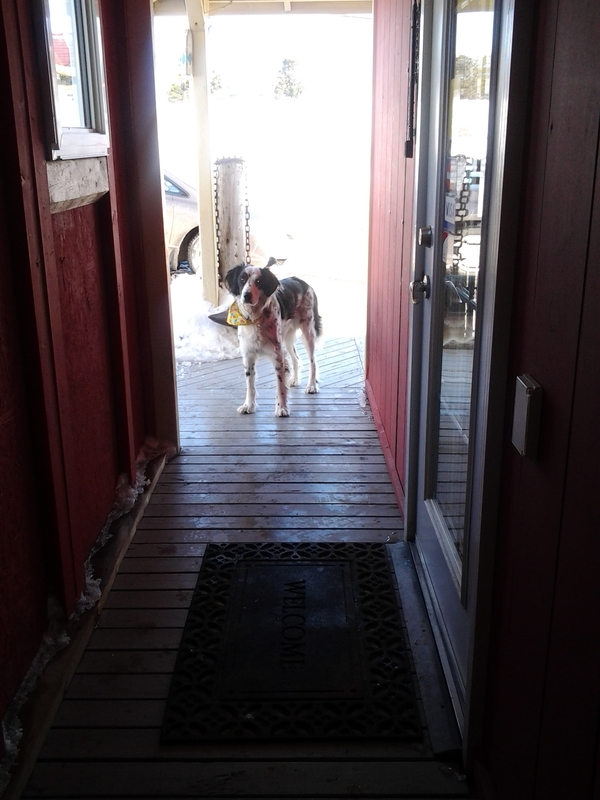 The resident dog was hanging out around the door. He made no attempts to get in but had a tennis ball just begging to be thrown. 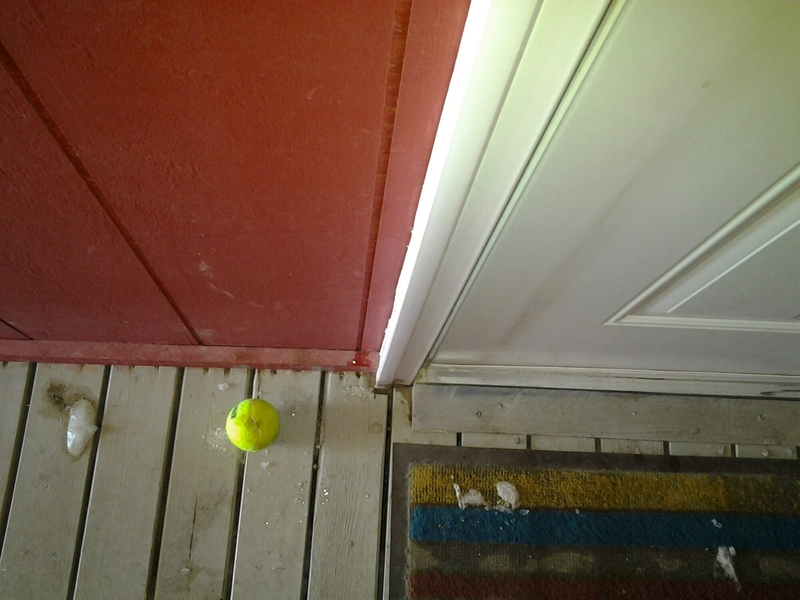 I went out to access the washroom and threw his ball for him. When I came out of the washroom, he was waiting for me. I asked him where the ball was and I swear, he nodded toward me and sure enough, he had the ball right outside the washroom door waiting for me. It was at my feet! 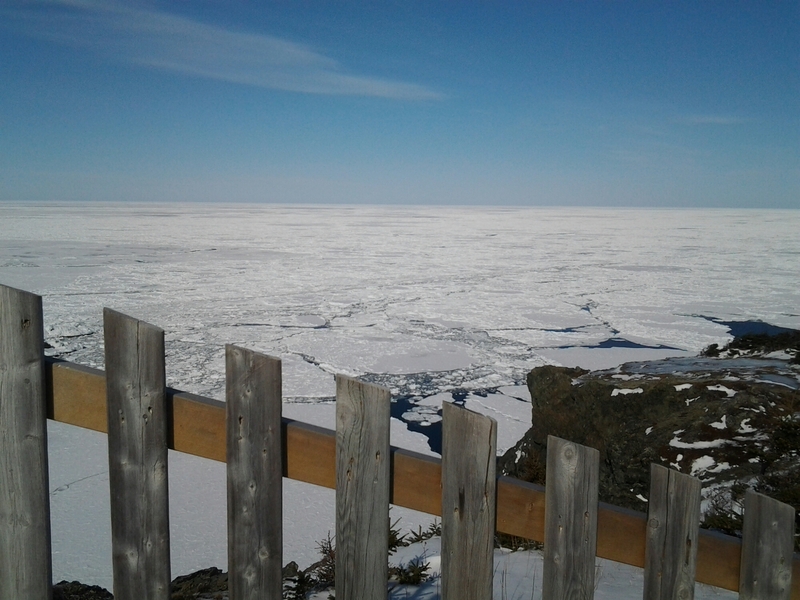 After Twillingate a drive to and through Durrell complete a visit. We always go as far as Blow me Down Lane. 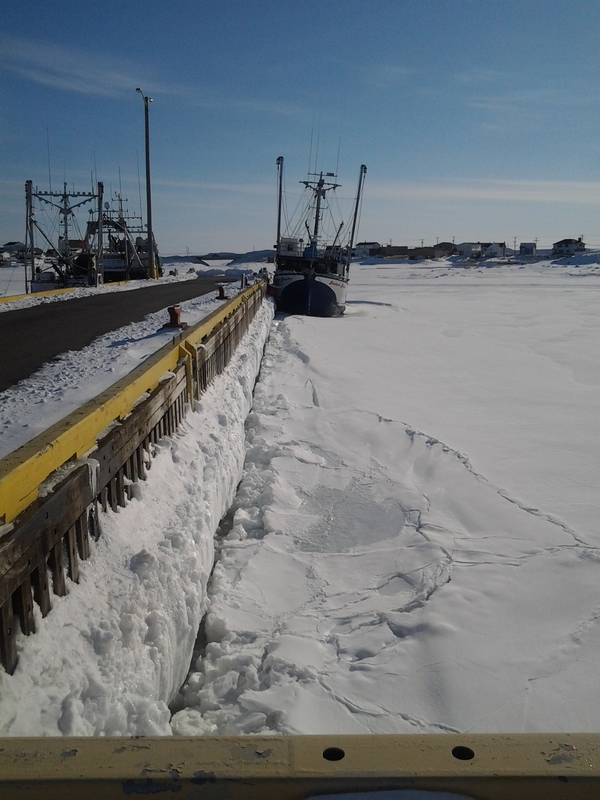 Longliners on the wharves in Twilligate and Durrell are locked in by thick ice. 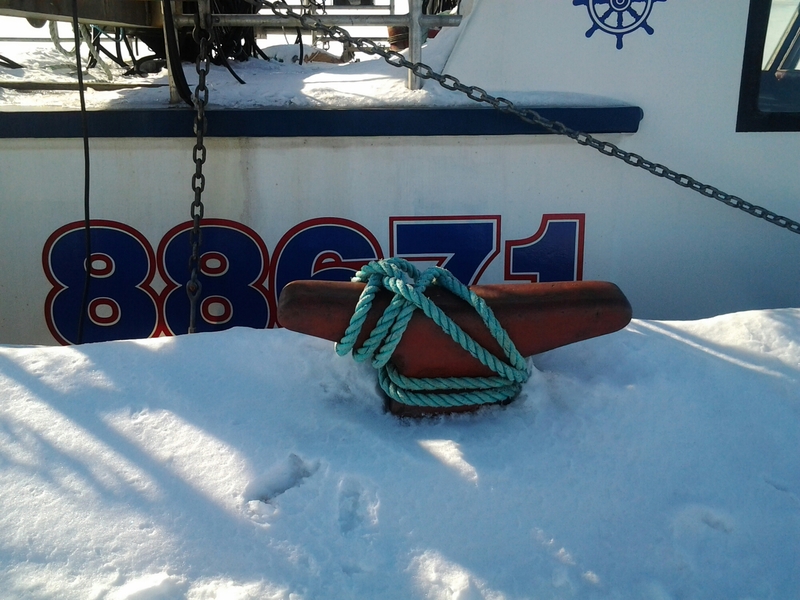 With the seals on their way and crab fishing not far off, it’s going to be a difficult year on captains and crews I think. 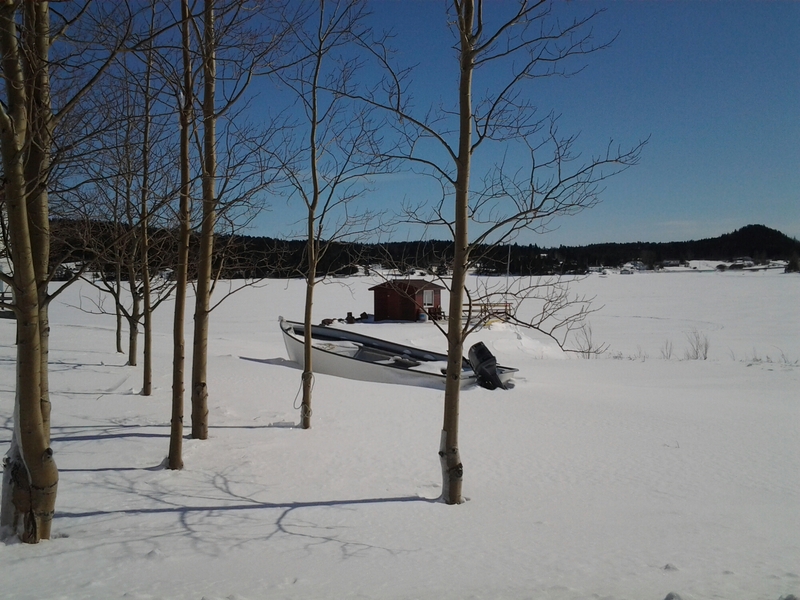 Because it was a warmer day, ice could be heard falling off the gear and sides of the wharvess but there were also snow mobile tracks immediately in front of these ice-locked boats. There will be no gear in the water any time soon. By five o’clock we were remembering we had a birthday party invitation for Saturday night and got on the road again for Gander. Relishing the long sunny drive we were able to stop for groceries using the handy list prepared a breakfast and arrived home at 7:30, a half hour before our invitation out. An evening out with good friends and laughter after such a refreshing day was welcomed and enjoyed. I’m not sure what time we finally got to bed but the deal was to sleep in and relax.Good deal. When the sideways snow started again on Sunday we were safe and snug with fresh supplies and those great Bread Box bagels. 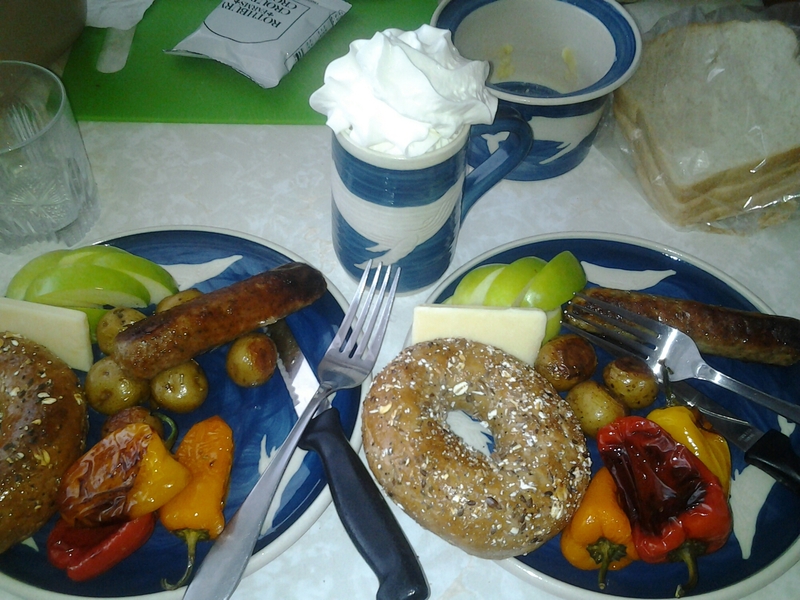 Breakfast in bed and when it came to coffee, I opted for cream too. Love reading your stories, although this one made me a bit homesick…..thanks for the great pictures! Sue, I thought about you. The Ashbourne house was so beautiful against the snow and I wondered how many pictures you really needed to see of it. We had such a lovely day. I Love your writing Diane. Your enthusiasm for life and people and places is infectious. Cannot wait to visit some of these gems you’ve highlight! 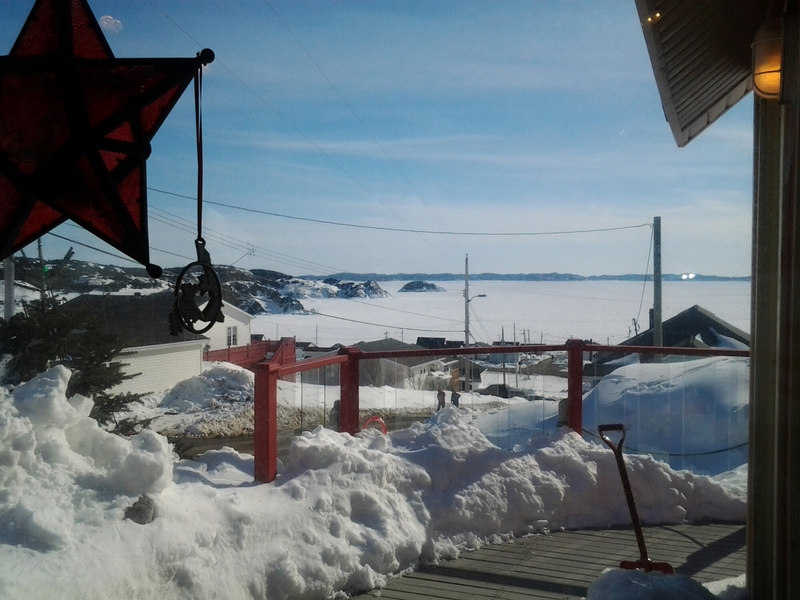 Leisurely Gander Loop: Greenspond May Never be a Day Trip Again!